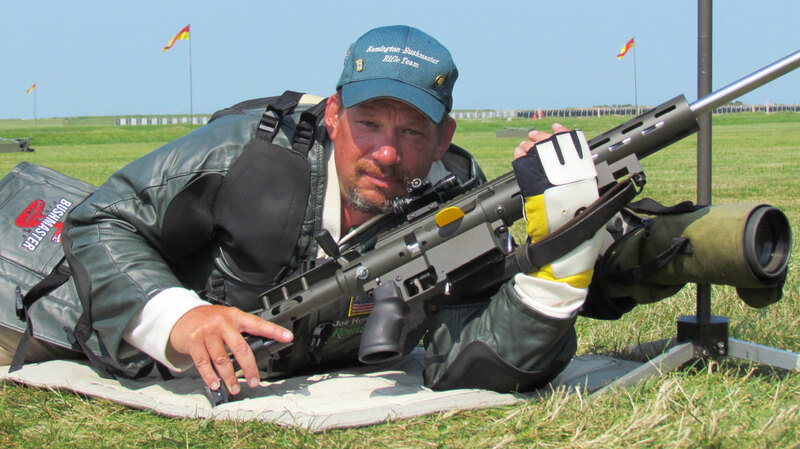 Joe Hendricks of Team Remington is the 2014 NRA High Power National Champion. This is Joe’s first National High Power championship, and he accomplished it through a gutsy, come-from-behind victory on the final day. This was no easy win for Joe, aka “Joesr” on our AccurateShooter Forum. Here’s the story of Joe’s 2014 victory at Camp Perry. One thing that made Joe’s victory even more memorable was that both Joe’s father and Joe’s son were there to witness the win. Three generations of Hendricks men were at Camp Perry to see his achievement. That’s a great thing for a family. On the last day of the High Power Championship, believe it or not I felt no pressure — because I really didn’t think I had a chance to win it all. I knew the leaders would clean the day and my only hope was that possibly one or two would falter enough to allow me third place. All I was trying to do was shoot Xs, so that I could move past two of the people in front of me and (maybe) secure 3rd place. I started the day tied for third on points with two other competitor, but in fifth place when you figured in X-count. Yes I was watching the board going into the final day and so many people say “Don’t watch the board!”. However, for me, looking at the board motivates me. The best I could do at 300 yards was a 200-6X, with nice groups, but not centered. That was not enough Xs and I knew I wasn’t moving up the leader board. I knew that simply shooting a 200 score wasn’t going to cut it and I still had work to do to get onto the podium (i.e. earn third place). At that point I figured I was still tied for third (disregarding X-count). So I went to the 600-yard line with goal of getting on to the podium. I was shooting for third at that point. I figured maybe with two cleans I could grab third place. Understand I know my competition and I know I’m shooting against the best High Power marksmen in the world. There were two people who have won this match before and several deserving champions just behind. So at this point, I’m wasn’t giving myself a chance to win — I was hoping to place third. The first string at 600 yards went well with nothing less than a 10. I shot a normal 200-10X, meaning 10s and Xs were mixed up with no wide shots. Apparently others faltered when I shot clean (all 10s or Xs) — I didn’t know that after the first string at 600 I was actually in the lead…. The second string at 600 yards was strange. I shot five Xs in my first 6 or 7 shots and then ran a string of 10s that were either wide or corner shots. So, after 15 shots, I wasn’t getting better, I was getting worse. I needed to get my act together (and right quickly). I took a moment to regroup and said to myself: “Stop this. We are not doing this today…” (i.e. we are NOT going to break down with just five shots to go). That’s something I heard Ken Roxburgh said to my son during their team match. That thought process changed my attitude, and it seemed to relieve the pressure, so I was able to concentrate on every shot. I was re-focused and ready to roll. I know Perry, I know the wind at Perry and I had confidence in my 6CM cartridge to shoot 10s through the final five shots. That confidence paid off — in the final five shots I broke every shot dead center and every shot came up an X! I don’t care where you place at Perry, if your final shot is an X you have something to take back for next year. Running five Xs in a row to end Perry is special. But, ironically, I can not say that running five Xs in a row to win Perry is a feeling I can actually remember, because, at the time, I thought I had finished third, not first…. After finishing the last string, I had a 1798 point total. I packed up my stuff, went over to the Remington golf cart, and told Ken Roxburgh that I was fairly sure I had placed third overall. I then walked down the line and I saw Brandon Green from the USAMU congratulating Norm Houle on winning. I paused for a moment and then walked over to Norm and asked him: “What did you shoot?” Norm replied: “I was down 13, how about you?” I then answered “Down 11″. Norm gave me a huge handshake and then it hit me. I had won. I was a feet away from my father. I went to him and said I think I won. Pricelessly, Dad said “Won what?” Then it hit him. Literally in tears, He called my mother to report the good news. At that point I realized this Championship wasn’t my life’s work, it was his. THANK YOU DAD! My son Joe Hendricks Jr. was in the pits and didn’t yet know about my first-place finish. He is 18 and has his own hopes for a rifle championship someday. When he came back from the pits, I said to him: “You don’t know…” He looked at me and said “Know what?”. I said “I won”, and he asked “Won what?”. Then I told him: “The whole thing.” I have never seen him smile the way he did at that moment. Next we call my wife on the phone (she was staying in Port Clinton, but wasn’t at the range that day). I tell her I won, and she says “Won what?” Again, I reply “The whole thing … I won the whole thing.” I hear only silence on the phone, then she says “Are you serious?” I reply, “Yes I am” and then there is a long pause, after which she says: “Joe, you aren’t messing with me are you?” I tell her: “No, I’m serious, come out here, you’ll see…” She pauses then says, “OK I will… but if you are messing with me YOU WILL PAY.” My girls say she almost wrecked the car driving out to the range. So my wife finally shows up at the Remington Team trailer. As she was getting out of the car she says “If you are [fooling] with me I will kill you. Did you really win?” In fact, she asked me three times before she believed it had actually happened. 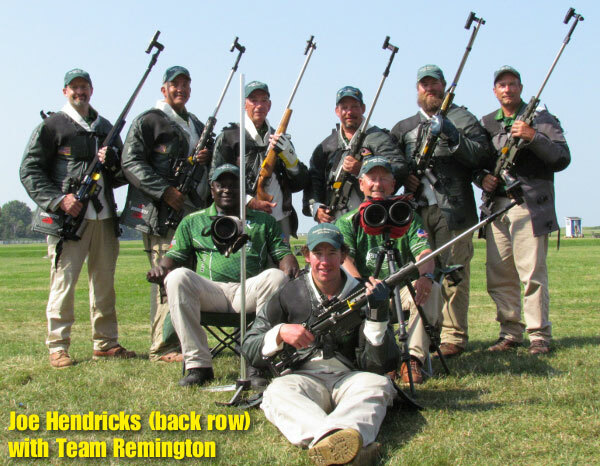 By this time Ken Roxburgh of Remington (my coach) had also called Carl Bernosky. Carl Bernosky has been a huge part of my shooting since I young. Having Carl be so excited about my win means nearly as much to me as the win itself. What a great day! Joe wanted to thank his sponsors Remington and Berger Bullets. The 6CM Cartridge he shoots is a wildcat based on the .243 Winchester. 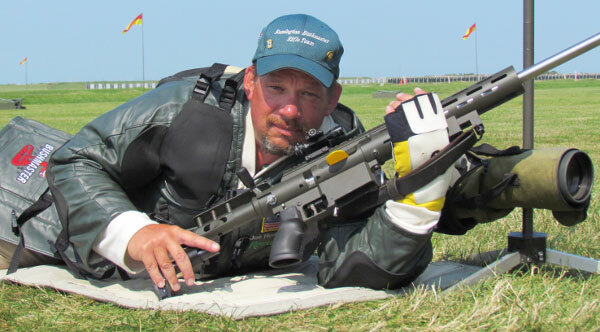 Joes uses slow-burning H1000 powder and he shot Berger 105gr 6mm Hybrids at Camp Perry this year. 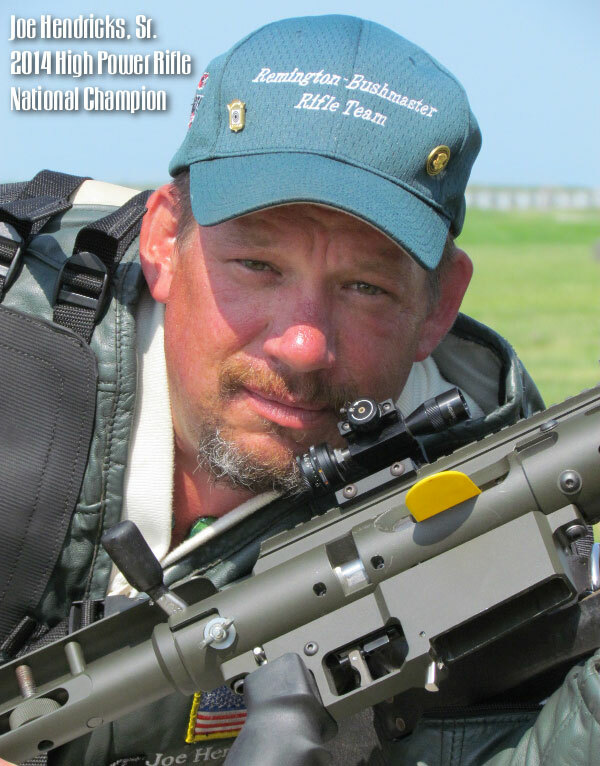 Share the post "How Joe Hendricks Won the 2014 High Power Championship"
Need a hunting scope or a good pair of compact binoculars? With Steiner’s Big Game Fall Optics Promotion, you can get 10% off retail price through the end of September on Steiner GS3 Riflescopes and Predator Binoculars. The savings are automatic — there are no rebate forms, no waiting — just instant savings. And the GS3 scopes are very nice. We’ve tried them in the field. They are sharp and clear, with nice controls. The 5X magnification range is definitely a plus for hunters. Hunters Will Enjoy This Video. It’s Definitely Worth Watching for the Outdoor Photography. 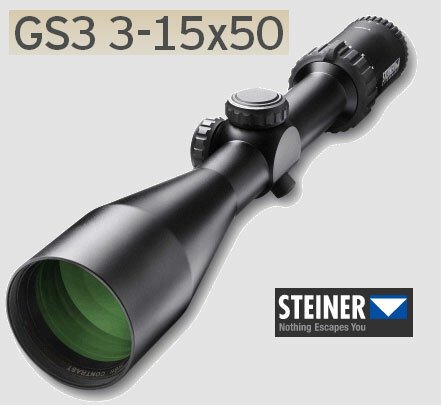 The new Steiner GS3 scopes utilize exclusive CAT (color adjusted transmission) lens coatings to amplify contrast in the peak human vision sensitivity range. The optimized contrast helps separate game from leafy or shadow-dappled backgrounds. The GS3’s 5x zoom range gives hunters great flexibility. Zoom to low magnification for a wider field of view, then zoom in at five times higher power when you spot your prey. The GS3 series scopes provide excellent low light performance, and mount on most rifles with standard-height rings. 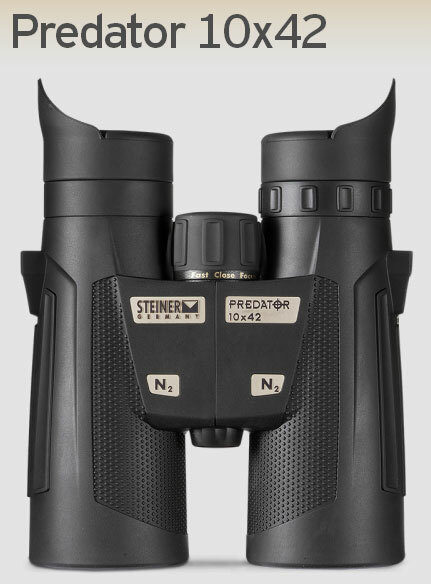 Steiner Predator Binoculars also utilize the game-revealing CAT lens coating to help hunters detect game in heavy cover and leafy environments. They feature a roof prism design in a tough Makrolon® housing. The high definition lenses deliver very good low light performance. At approximately 10 ounces in weight, the 8×22 and 10×26 compact models are small enough to fit in a pocket. The larger 8×42 and 10×42 models (below) offer greater low-light performance. We wish these binocs had captive lens covers, however. We try to keep ocular and objective lenses always covered except when glassing. Share the post "Steiner Offers 10% Off GS3 Scopes and Predator Binoculars"
Armalite, the original manufacturer of the first AR-platform rifles (AR10, AR15), offers some interesting products, including the AR-30, and AR-50, both very capable long-range tactical rifles. If you are interested in one of these big rigs, or any other Armalite products — here’s a way to save 10% off the purchase price through the end of September. Simply go to the Armalite website and use Coupon Code SEPT2014 (normally you enter this code during check-out, but you must call for firearm orders). This little tip could save you a whopping $336.00 on an Armalite AR-50A1, which retails for $3,359.00. Come on — admit it, you’ve always wanted a Fifty. Now’s a great time to add one to your arsenal. 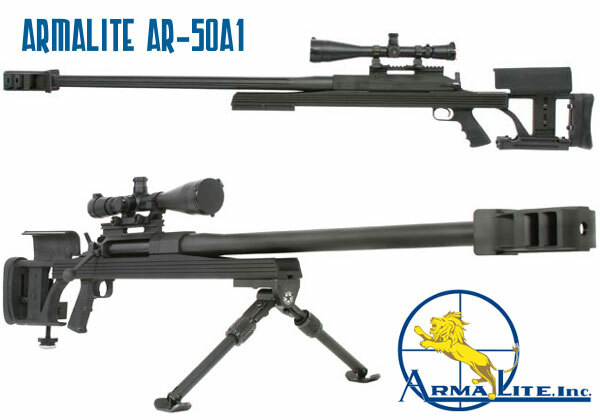 Share the post "Save 10% on All Armalite Products with Code SEPT2014"